André was a zealous Jehovah’s Witness for over 30 years. He was married to a wonderful sister and they had three children together. However, things started to change for André. He was beginning to have doubts. His relationship with Jehovah was beginning to wane. Eventually he, along with his wife and children, stopped attending meetings. After leaving Jehovah, André and his wife agreed to split up, and they now share custody of their children. After three years being out of the organization, an elder that was once close to André contacted him by phone to try and encourage him to return to Jehovah. Here is André’s interpretation of that conversation. I was out walking with the dog when the phone rang. It was an unknown number, but I was at work, so I answered it as normal. I froze when I realized that it was an elder from my former congregation, Brother Kevin. Of course, the memorial is coming up; I was expecting this call. But I wasn’t ready for it. It caught me a bit off guard. Brother Kevin introduced himself and asked how I was doing – the usual small talk. I told him that I was doing fine, the kids are happy and life in general is good. My mental health – the original excuse I used for leaving – was improving, I told him. He went on to tell me his real reason for calling. He wanted to set up a shepherding visit with another elder, with the intent to see how I was doing and if they could encourage me to return to Jehovah. Shepherding visits are visits Jehovah’s Witness elders make to encourage their brothers and sisters to continue serving Jehovah the Watch Tower Corporation with joy. This is when I had to decide quickly what battle I would choose: Pick up the Sword OR Dodge the Bullets and go back to my safe spot. I took the careful approach. I told him in a gentle way that this is a difficult question. I would consider such a visit like that as a trap to get me to say something they could use against me later, and that this would cost me my family. I also told him that I knew from the Shepherd book that just speaking to the Elders should be viewed as recognizing their authority over me. He, of course, said that this was far from their intention. He said they just wanted to encourage me without any desire to disfellowship me. I asked him if he could understand why I was worried, given the Jehovah’s Witness doctrine of shunning, and that this would mean that I would lose my siblings and parents. He said he could understand my concern, but this was far from the reality here. Well from there it all got started. This Elder is a nice guy. The conversation that ensued would never have happened if he was not. I told him that the setting with two elders would be wrong for me. I wouldn’t be able to play along and it would just end badly. I respectfully declined the offer. We talked a little more, and he started asking a bit. I then asked him if I could speak freely and we could talk about this just between the two of us. I asked him if he would respect my concerns and give me the right to speak. He promised that it would just be the two of us and that I wouldn’t get in trouble for it – time will show if he was lying. So then I got started. I told him that after I hit my mental breakdown, and my family split up, I needed to take a step back and really do research and restart my life. I have shared custody (50%) of my three children. When they are with their mother, they live in a home with two mums. If I were to raise them as Jehovah’s Witnesses within such an environment, things would prove very difficult for them growing up. I needed to be sure that this is The TruthTM. And if it is The TruthTM, it must stand up to scrutiny. He agreed with me. He could understand my choice. I told him that the more I did research, the more my conscience told me that I could not bring my children into The TruthTM. And I could not keep going myself. It was not about being stumbled. Tt was not about emotions. It became a clear choice that I had made. I told him I watched the JW Broadcasts, read the magazines, watched the convention highlights. I explained that the more I did this, the surer I was of my decision to leave. There is no way a shepherding call could change that, I said. He then asked me what my concerns were with the organization. I needed to be smart and calm when handling this question, and not go into everything. I had to focus on matters that were not apostate-influenced, as this would turn the conversation sour. The Story of Noah and the Great Flood​—Is It Just a Myth? Therefore, I began my response with The Flood & Noah’s Ark. I told him that this was one of many examples where Jehovah’s Witness doctrine just didn’t stand up under scrutiny. I made a few points and said that there was no way I could believe something that was completely dismissed by all forms of science, math and logic. There was no way I could demand this of my children. I used this as an example to show how Jehovah’s Witnesses and the governing body of Jehovah’s Witnesses totally refuse to accept science and logic. For a few moments, we discussed a few of the arguments and the science, and he had no valid defense. He simply reverted to the pathetic argument that ‘we must wait on Jehovah’. He chose to believe in Noah and the flood, even if he couldn’t understand it all. He said that if it was in the Bible, he just had to believe. I told him that it was a Jehovah’s Witness’s choice to believe that the Flood was global. They could easily change the doctrine to explain it as being localized and still fit in with the Bible’s narrative. It’s unlikely they will ever do it, no matter the evidence. We agreed to disagree on that matter. I asked him if he felt it was right that God decided to kill every human and animal by drowning them. God killed everything on the entire planet without warning. The very idea that Noah was preaching was absurd to me: He had no means of transportation at all and was busy building this gigantic boat. There was no way he could preach to anyone distant, say in Australia or America. And what would he tell them? This was at a time when there were no written rules, no way for anyone to know what God demanded. How could he set the bar so high that it meant that everyone was evil? How could this be justified? How would a kid in China have any idea why he suddenly got drowned? What does that say about God? He responded by saying that this was all about believing in Jehovah. He said that Jehovah had an organization here on earth. He said that the evidence was everywhere that Jehovah had chosen the Watch Tower Bible & Society and its cooperating entities as His organization. Even if he had no answers, and couldn’t understand it all, he just knew that it was The TruthTM. Couldn’t everyone in their respective religions say the same thing, I asked. A Mormon would say the same. If it is just about believing, how can you justify that this is a good thing? Are we to say that someone who is born as a Jehovah’s Witness is fortunate but is deserving of death if they are born into any other religion? He said he couldn’t answer that. He said that there was a lot of things we didn’t understand about Jehovah. We would need eternity to understand it all, he said. Again, I asked, how can one justify the death penalty for those who are not Jehovah’s Witnesses, when it is all just a matter of faith without evidence or logic? Couldn’t any religion make that claim? Jehovah’s Witnesses believe that God will use hail, earthquake, flooding downpour, fire and sulfur, lightning, disease and His enemies to kill each other at Armageddon. I asked him how he could justify a doctrine that said that more than 99.9% of the world’s population will be killed in Armageddon when there is no evidence, no science and no real logic proving that Jehovah’s Witnesses are the only ones deserving of living. Once again, he reverted to ‘faith’. He also tried making the claim that this was not a Jehovah’s Witness teaching, but rather it was up to God to decide. I told him that he should watch the morning worship in the JW Broadcast where Tony Morris III says that Jehovah’s Witnesses will be the only group protected in Armageddon. He didn’t have any answer to that. Instead, he chose to trust in Jehovah because he believed the Watch Tower Corporation was his organization. He admitted that he had doubts about several issues. He told me that, decades ago, one of his best friends left The TruthTM. At the time, his friend sent him a letter explaining why, mainly focusing on 607/1914. He had read the letter, he told me. However, he made a choice at the time to trust in the organization and leave it in their hands. I asked him if there was a limit on that trust. I asked if that trust would remain no matter what he found out, no matter the arguments, the science, the logic, or the doubts. Is there no limit in your trust? I asked him. He said no, he has chosen to trust in Jehovah. I then asked him if any religious person could say that about the religion they belong to. Couldn’t they choose to believe and trust the religion they were born into, no matter the evidence to the contrary? I asked him how he responds when someone makes that same argument when he goes door-to-door in his preaching work. Again, no answer. Trust in Jehovah, he said. It will all make sense in the end. We talked for a little longer. I talked about the shunning and how they use the family unit as extortion. I referred him to the stories in Denmark and he agreed with most of it. However, he reverted to trusting in Jehovah. I told him I had no intention in attacking anyone’s belief. Rather, I asked him to respect my decision. He said that he would do that, and not use this discussion as a judicial matter. He said that simply losing faith was not a judicial matter and that I would not get in trouble for this conversation. He said that it would only be a judicial matter if I started living an immoral or sinful life. We agreed that there was no point in having a Shepherding visit. Jehovah’s Witnesses claim their faith isn’t blind but when challenged, a different story begins to emerge. Conclusion: The thing I’m left with after this is the feeling of power. The tables have completely turned because I’m not indoctrinated anymore. I spoke my mind, free and without fear. I based my choices on valid arguments. My decisions stand up under scrutiny, are in line with high moral values, and are consistent with science and logic. I can face the facts. I can defend my decisions. I can stand my ground. For him it was the total opposite. He became a tiny person, without any valid argument. He had nothing that could stand up under scrutiny. Everything relied on blind “faith”. That is how it is for any Cult member. 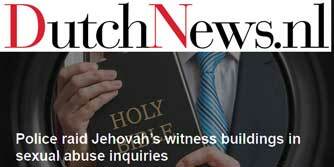 ← If I’m A Gay Jehovah’s Witness, Is Heterosexual Marriage The Answer?